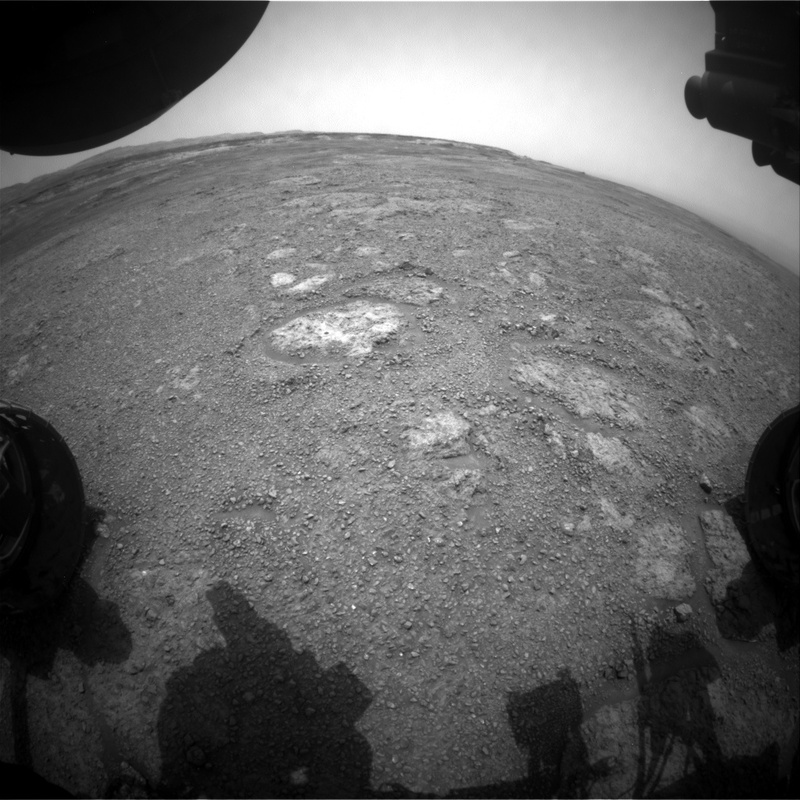 Image taken by the Front Hazcam: Left A (FHAZ_LEFT_A) onboard NASA's Mars rover Curiosity on Sol 2286. The drill hole is the dark feature on the largest light toned area on the large block slightly to the left of center of the image. In today's planning, we will dump the remaining rock powder from the drill and investigate it with all instruments, starting with APXS, which will perform a two-step raster. Sol 2288 contains a range of ENV investigations, dedicating the morning science block on sol 2288 to a passive sky observation and a Mastcam tau to see how the dust loading in the atmosphere is changing. The science block of sol 2289 is dedicated to spectral analysis of the dump pile with ChemCam passive and Mastcam multispectral investigations. ChemCam is holding off on its active LIBS observations of the dump pile until we know that APXS and the spectral analysis completed successfully, thus there are two bedrock observations in the sol 2290 plan, the targets are Dufftown and Lairg. Both will be investigated with 10-point rasters to further capture the bedrock variability we have been seeing. Monday's plan will be the last one at Rock Hall before we start our descent of the ridge and into the clay unit. I am excited to explore the new terrain, and so is the entire team!